Meet Jack Pattern. Up and charming trio from one label Lustpoderosa. Those guys make silly sounds, and in another language: “Bango, Behau, Baqua. Blackout!”. At least, that’s how it quakes on their new EP. Jack Pattern, it’s a downright pleasure principle. And what a lovely mix they did for us! We are three club music loving hombres. We’re no purists. It’s about playing what we feel. Acidic, raw and cosmic house, disco and techno. 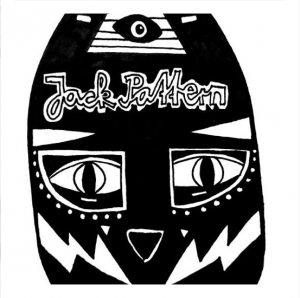 And other hybrids and mutants of legendary club music that shaped the sound of Jack Pattern. We love our eclectic lifestyle. Love, rush and euphoria! We bring in over seventy years of experience to the game. We fiddled around on quite some gear: From the english flute to the modular synthesizer. Who does the production part and who DJs? Four hands throw records into the mix and six hands mess around in the studio. You’re Zürich based. What’s your favourite hangout there? Our studio, naturally. And there are many places we like going out. There are the squats and there is club Zukunft. We have a club night at Kauz, too. That’s a lovely place. The people, the cocktails, the management, the works. And it has a great sound. Is there anything that’s missing in Zürich? It would be great to have more sun in Zürich. Otherwise, we can’t complain. The city treats us really well. Nice people all over the place. There’s your vinyl-only label Lustpoderosa. Yeah. We only released our own stuff until now. Maybe in the future also stuff by others. Our new EP of course, the second release. Including a very fine remix by Ruf Dug.